Moxtek® has invested many man-years of research into producing high performance polarizer options to complement many emerging technologies discussed in this paper. The need for high performing UV polarizers has been growing dramatically both in size and breadth of application. Moxtek® has invested many man-years of research into producing high performance polarizer options to complement many emerging technologies discussed in this paper. The well-known Moxtek Ultra-broadband, UBB01A polarizer was introduced several years ago and has received wide acceptance for UV applications. However, this polarizer is not specifically designed for use in the UV spectrum. 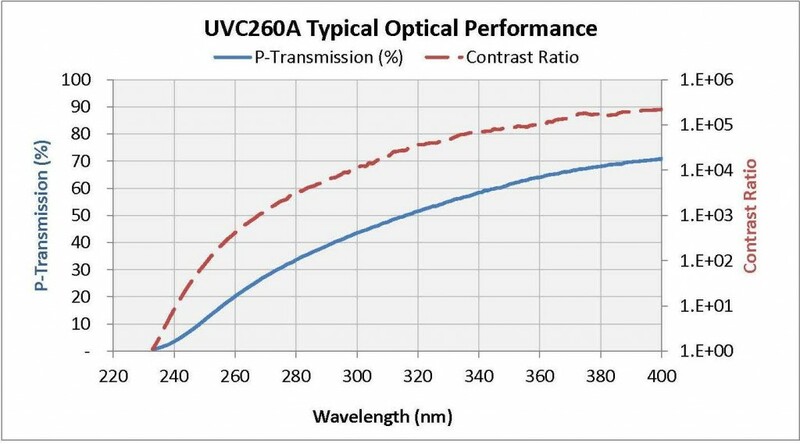 ProFlux® Nanowire® Ultraviolet polarizers offer excellent solutions for UV and DUV applications. They are specifically designed for UV applications from 240nm to 400nm. Also, by nature of Moxtek’s patented Nanowire® technology, these polarizers are broad band capable and on fused silica substrates, function well at IR wavelengths up to 4um. High transmission and high contrast choices are available. The large acceptance angle eases alignment concerns. Durability is equivalent to our standard visible spectrum products recognized for their high durability in hot and environmentally difficult applications. For a partial listing of the features and benefits of these polarizers, see Table 1 – Features and Benefits of ProFlux® Nanowire® UV Technology. Polarizer use in the ultraviolet spectrum includes a wide variety of applications. Some of these are described below. • Precise alignment for the LC display industry is made possible with linearly polarized UV light in the 240 to 300nm range to generate anisotropic alignment film. Conventional rubbing of polyimide generates dust, static electricity and mechanical damage. UV polarized light allows high speed generation of homogeneous and stable bias tilt angles without fluctuations over large areas. • Visible only under polarized light, an image or security ID is printed onto currencies and securities to reduce forgeries, onto pharmaceutical containers to reduce counterfeiting. • Polarized UV light can assist in the detection of diseased tissue. The picture is an example of a polarized enhanced image of morning glory anomaly of the optic nerve. • Forensics can be assisted with identification of tissue using a polarizing microscope. • Ultraviolet imaging of objects in space gives an enhanced view and can detect differences not seen in visible light images. NASA Hubble Space Telescope high resolution UV image of Jupiter’s satelite Io is shown here. 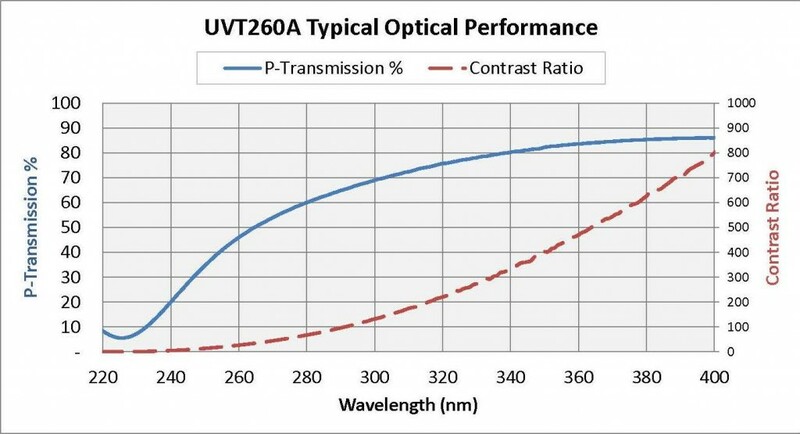 • Moxtek UVC260 and UVC240 polarizers can be used in spectrometers where the small size, wide acceptance angle, uniformity, and broadband capability offer substantial performance enhancements and versatility compared to Glan-Taylor prisms. • Traditionally, Glan-Taylor prisms are used in this application. However, the UVC series of polarizers have comparative contrast and transmission and offer the additional benefits of AOI independence and require far less space, have no optical aberrations, and are only about 2mm thick. See Table 2, Comparative Summary below. The high transmission products are designated UVT and the high contrast products are designated UVC (see Table 3). The table shows the UV performance by wavelength. As mentioned, these polarizers work excellently up to about a 4 um wavelength, thanks to very specialized and high grade fused silica substrate material. If you need a broadband polarizer with enhanced UV capability and performance in MWIR, then contact a Moxtek representative for full performance specifications. 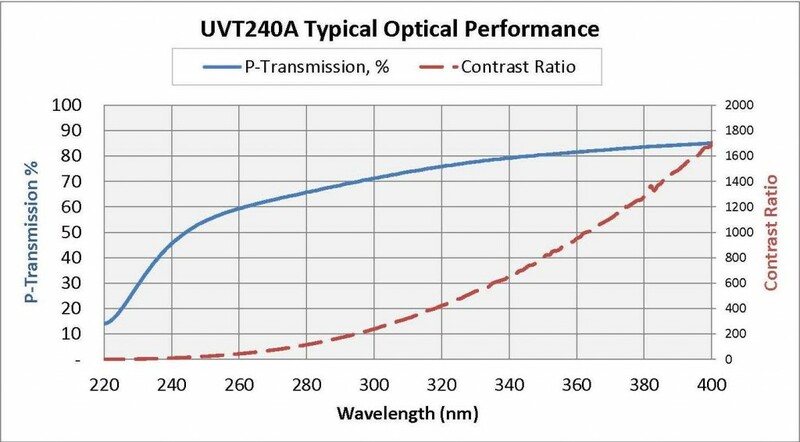 Figure 1 shows actual product transmission curves which demonstrate excellent polarizer performance for the UV and DUV spectral range. The UVC products are designed for applications requiring high contrast at the expense of transmission. These products are created by bonding two UVT polarizers together facing each other so that the wire grids are on the inside of the assembly. This enables the high contrast with the added benefit that the wire grids are protected.